12' x 56' Sales Office Trailer with wheelchair ramp. Sometimes a mobile office trailer is the best space solution available when your company needs a professional sales office with comfortable furnishings on site. Are you ready to rent? 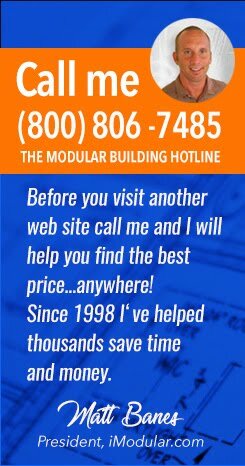 You can use the iModular price quote tool if so..otherwise read this post and get a few ideas brewing. Let's say you are a real estate developer that needs a sales office to pre-sell building lots or homes. Or, maybe you have a marina and need a professional setting to sell boat slip rentals or even yachts. Get the picture? 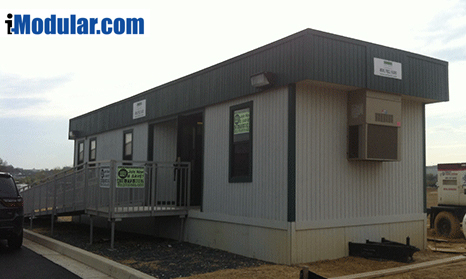 Sales Office Trailers are a perfect fit if you are searching for quality office or retail space to rent or buy. Various models are available nation wide from local suppliers in sizes ranging from 12' x 40' to 24' x 60' with upgraded interior and exterior finishes, furnishings, kitchens and bathrooms, HVAC, handicap access ramps and steps. Larger and smaller custom sizes are also readily available. One final thought - be creative with your office space needs. Mobile office providers are capable of making floor plan changes and installing custom interiors if you are willing to invest in the details that make a difference in your sales presentations.